Losing your hearing is generally something that happens gradually as we age but it can happen at any point in our lives young and old. At first we notice that we’re not following conversations particularly well, especially when there are several people talking, then the television volume levels creep up, finally we have to admit that we’re struggling. It’s not an easy admission to make to yourself, even harder to admit to other people but as with all medical issues, the sooner it gets dealt with, the sooner you can find a workable and practical solution. The good thing about hearing issues are that there are solutions out there and they’re not as cumbersome or as obvious as you might think. If you are recommended to wearing a hearing aid, you’ll want to know which one is the right one for you. You can learn more here and from our handy guide below. 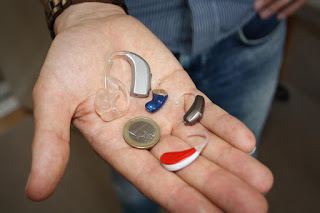 When you’re looking for a little discretion and don’t want people to focus in on your hearing aid, there are some very smart, very discreet options out there that will suit you down to the ground. These hidden aids are still powerful but they’re not the cumbersome versions of yesteryear. They can be placed just inside the ear and are generally the color of your own skin tone to be even more hidden. There are several different versions so talk to your hearing specialist about which option will answer your needs and help your hearing and self-confidence. Behind-the-ear options are still on the market but if you have an image in your mind of large, unwieldy contraptions with lots of wires, think again. These days their modern designs mean they are much smaller and tuck behind the ear very snugly. Like the in-ear versions you’ll be able to choose from a range of wiring options and colors and will be pleasantly surprised at how easy they are to operate remove and replace. If you currently wear glasses you might be able to have your hearing aid fitted into the arm of your glasses that sits behind your ears. Combining your aid with your glasses is the perfect way of providing a two-in-one solution and means that wearing your hearing aid will become as natural as putting on your glasses when you get out of bed in the morning. A discreet and stylish option that means no one will need to know that you’re wearing one. For those who can’t wear hearing aids in or behind the ear there are other options available such as bone conducting devices that are attached to the skull and packs that are worn on the body. Talk to your specialist to decide which device will work best for you. If you are experiencing any of the symptoms described earlier on, don’t panic, it’s more than likely that there will be a workable solution for you that will suit your style, budget and lifestyle down to the ground. Have a look on lifestyle blogs that discuss hearing loss for some reassurance and take back control today.